Samantha works in a start up environment where proving the return on PR efforts and spend is crucial. While she pulls from nearly 20 Google Analytics reports, she focuses on showing the number of “sign ups and payments” resulting from referral traffic from placements her in-house or agency team have earned. 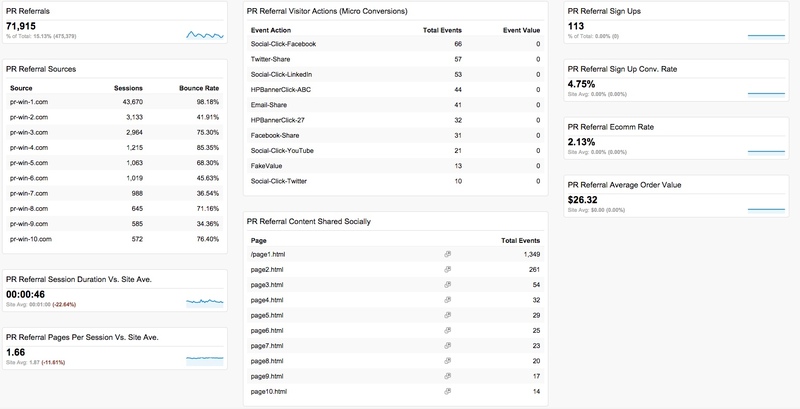 On Site Metrics; How Does PR Traffic Behave? In addition to referral traffic data – which PR efforts are working — Jill Van Nostran Communications is interested in on site metrics, giving a holistic view to the visitors’ experience. What are the top content pages (this shows whether or not our content marketing efforts are effective — are they interested in other blog posts? Jill also stressed the importance of Geographic data to make sure you’re attracting the right audience for yours or your client’s business. Google Analytics now has a Demographics and Interests reports section showing Age, Gender, Affinity Categories, Market Categories. If you haven’t seen them, it’s worth a read. A simple press release tracking URL you can use is to add this query string to the end of any link you place in the release; ?utm_source=prnewswire.com&utm_medium=pr&utm_campaign=InsertCampaignNameHere. The Source value should be changed to whichever newswire you’ve selected, the medium should remain “pr” or however you refer to your efforts, and the campaign value should be specific to the content of the release or “campaign” you’re running. As you review the dashboards keep in mind these can easily be edited to match your site goals. Ask your web analyst to match the “Macro” goals to whichever is your primary conversion goal on the site, and the “Micro” goals should be used for things like social media shares, social follow clicks, or RSS feed sign ups. Those actions can be tracked with Google Analytics event tracking, and created into goals. What else are you measuring?